A short article I came across about this book piqued my interest in it. I’d already seen a couple of mentions about it, and was ready to disregard it, until I read the basic premise. 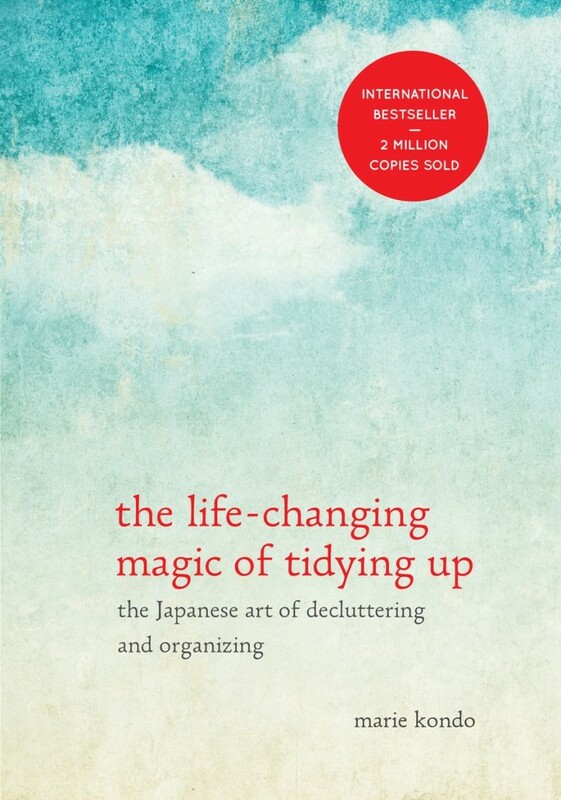 Marie Kondo’s tidying philosophy is so simple – only keep things that “spark joy”. I think this book really resonated with me because I’ve been so unhappy with our living space lately. It has become overrun with clutter. I have boxes upon boxes of stuff that I just don’t know what to do with. I had a closet full of clothing that I didn’t love. Books I have had on my shelf for ages that I don’t care about reading anymore. I’m just done with all of it, and I’m tired of storing this stuff that I don’t care about. I was already in the middle of a great amount of discarding, but this really pushed me forward. Now, the idea of having a closet full of things that I am excited about wearing, books I am excited about reading, and other things that “spark joy”, is really attractive. I kind of lost steam of my “One Year to An Organized Life” book blogging series that I was doing, mostly because it was moving too fast. The monthly sections were just too much to undertake in one month, and I was ending up with a pile of stuff at the end that was in a bit of a holding area, since I didn’t know where to store it and the rooms I wanted to store them in were so messy and cluttered that I didn’t know what to do with them in the meantime. The one thing that I feel is lacking here – although she does address it – is the fact that I have no control over other people’s things and that is part of the problem. Being overrun with toys and other things that don’t give ME joy, but may give joy to my family members – or that they are not psychologically ready to part with for whatever reason – is a huge part of my clutter issues. Her contribution to this problem is to simply take care of your own things, and the zen-like aura emanating from you will be contagious, but I really will have to see it to believe it. This was one of those ah-ha! moment quotes from the book. It made me think about how I’m storing things, and that I can organize things to be perfectly neat and tidy and it all falls apart within days. Also, unless it’s something that I use at particular times (like holiday items), why am I storing things in a way that makes it hard for me to get to it? It just makes me less likely to use it. If I’m not using it regularly because it’s a pain to get to and that doesn’t effect me in my day-to-day life, then I should just discard it. The above quotes were some of the biggest take-aways for me from this book. I do hang on to several item “just in case” and half-read books, some clothing, and buttons are big ones. I’m 31 and I have never used a spare button. I’ve forced myself to finish books that I hated. I have a ton of clothes that I save for a someday occasion or size that by the time I even get close to wearing it, I don’t even like it anymore. I’m not really into all of the spiritual things that she brings up in the book. I’m not going to start asking my house where it wants me to store things. But hanging onto things out of a sense of obligation to either ourselves or others when the utility or joy of the thing has passed is pretty silly. It just creates more mess to contend with. And I, for one, am tired of dealing with it. This book fulfills the originally written in a different language requirement for the challenge.